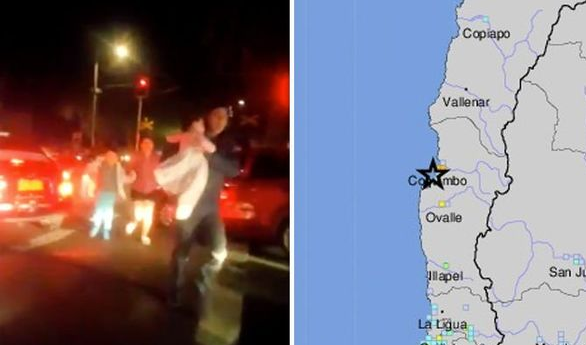 A STRONG earthquake has struck near the city of Coquimbo in central Chile resulting in at least two deaths - one in Punitaqui and one in Coquimbo. Both died after suffering heart attacks during the earthquake.A tsunami warning was initially issued but quickly cancelled. The quake hit at 10:32pm local time (1:32am GMT) and was centred just off the coast. The epicenter was about 15km (9.3miles) southwest of Coquimbo, which is a major port in the region of the same name. The initial tsunami warning for the Coquimbo Region was issued by the National Office of Emergencies.Damage has been reported at several locations, but there was no immediate news of any casualties. The quake was felt strongly in northern Chile, where buildings swayed according to social media reports. According to ONEMI Director Ricardo Toro, more than 200,000 people in the area were suffering power outages. Footage from locals showed crowds of people evacuating and even people running carrying children during the brief tsunami warning. Chile is situated on the so-called ‘Ring of Fire’, where the earth’s tectonic plates meet and rub against each other. This area of the world is where the majority of earthquakes take place and where volcanic eruptions occur more frequently. Chile suffered the largest earthquake ever instrumentally recorded in 1960, when a 9.5 magnitude quake struck of the coastline. Thousands of people were killed in the destruction that followed. In 2010, an 8.8 magnitude earthquake and the resultant tsunai killed 525 people and left 26 missing.